These folks were very helpful! I give a thousand kudos to Ms Kelly! She's the Bomb and a great person with a huge heart! Thanx very much My. Kelly! (Asst Manager) I was very satisfied with my experience at that location! Stopped by the dealership on a whim but was greeted by the Salesman (Jeff Comin) like a loyal customer. Throughout the whole negotiations Jeff and his Manager (Mike McM.) treated me with curiosity and respect. I ended up purchasing a 2019 QX50 and since I took delivery of the new SUV I have had numerous questions. Each of my calls where/are promptly retuned by Jeff. Definitely a 5 star dealership !!! Jeff is the best sales man I dealt with in a car dealership, he went above and beyond in getting my previous lease taken care of and getting me a new lease. He patiently worked with me for more than a month while I was figuring out what I need. For a truly exceptional experience when you’re shopping for a vehicle or getting car repairs, come to the experts at Cochran INFINITI Gallery of North Hills. Our team strives to provide the VIP treatment for every guest, as we’re looking to build lasting relationships to better serve you. From hassle-free INFINITI financing to expert INFINITI service, our Wexford INFINITI dealership has everything you need all in one place. Go One Better and choose Cochran INFINITI Gallery of North Hills! Our stunning selection of new INFINITI luxury sedans, crossovers and SUVs makes it easy to find the vehicle you’ve always wanted. From sleek new INFINITI Q60 sedans to spacious new INFINITI QX60 crossovers, we have a wide range of options you’re sure to love. We also have a variety of new INFINITI QX80 lease specials and QX50 finance offers to help you get the keys to the new INFINITI model you love for an amazing price. To save even more, you can explore our inventory of used INFINITI vehicles and Certified Pre-Owned INFINITI models. Plus, our INFINITI finance specialists will be here to help walk you through the car-buying or -leasing process to ensure you get exactly what you want. The Cochran INFINITI Gallery of North Hills service center is your top choice for INFINITI service and auto repairs in Allegheny County. You can schedule INFINITI service online to book your next appointment, or take advantage of INFINITI Express Service to get a quick INFINITI oil change, tire rotation and more. Browse our INFINITI service specials to save big and check out the INFINITI parts and accessories we have for sale to get everything you need. 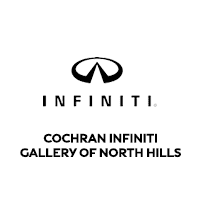 Visit Cochran INFINITI Gallery of North Hills to receive a first-class experience each and every time. We’re located at 11740 US-19 in Wexford, PA, just a short ride away from Franklin Park, McCandless, Penn Hills and the rest of the Pittsburgh area. We’ll see you soon!